How do you memorialize fallen in a war without end? 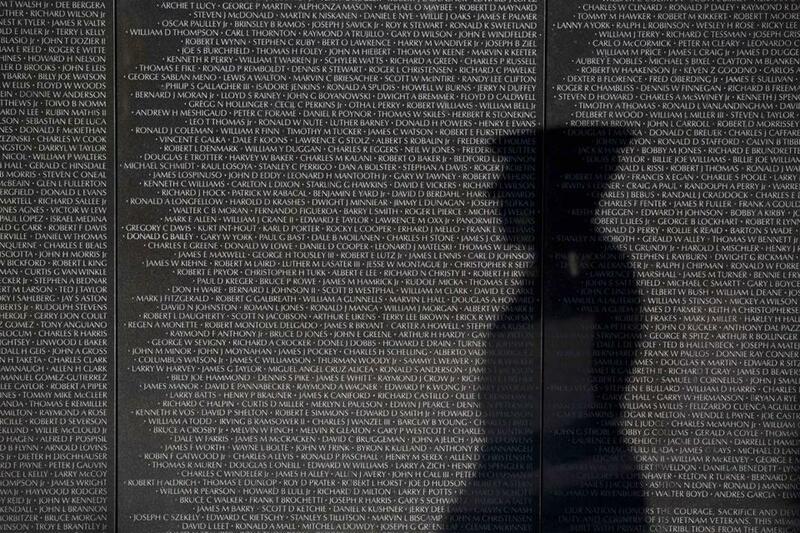 The Vietnam Veterans Memorial, unveiled in 1982, was the first of its kind on the National Mall — commissioned through a nonprofit, and not the federal government. WASHINGTON — The National Mall is chock-full of monuments to America’s war dead: the fountains and pools of the World War II Memorial, the relentless, black wedge of the Vietnam Veterans Memorial, the haunting statuary of the Korean War Memorial. Yet to be memorialized, however, are the estimated 7,000 men and women who have died in the longest conflict in the country’s history. It’s a war that began on 9/11, has shifted across multiple countries including Iraq and Afghanistan, has often been conducted under a cloak of secrecy, and still has no foreseeable end — even after 16 years of conflict. But a fresh effort to honor the fallen veterans of what has become known as the Global War on Terrorism is underway, in the form of bipartisan legislation cosponsored by two Marines-turned-legislators, Representative Seth Moulton, a Salem Democrat, and Representative Mike Gallagher, a Wisconsin Republican. The bill would waive a 1986 law that says a federal memorial cannot be built on the Mall until 10 years after a war’s end, which has frustrated activists and relatives of those lost to this war who say the waiting period is archaic and arbitrary. The war on terror is different from any before it, with its prolonged counterinsurgency operations, nighttime commando raids, and strikes by combat aircraft and drones in distant countries. Moulton and his supporters say a one-time special exception from the 1986 statute is necessary — and they appear to have a powerful ally in new Interior Secretary Ryan Zinke. Zinke’s department recently wrote a letter to Congress in support of the Global War on Terrorism Memorial and Moulton’s legislation, which breathes new life into the project. Moulton’s bill would task a nonprofit called the Global War on Terrorism Memorial Foundation to raise funds for the commemoration on its own, without federal help. The group would scout the memorial site, plan its design, and oversee its construction, granted the statutory exception was approved. The supportive stance of the newly appointed Zinke, who declined requests for an interview, was not a surprise. Before he joined President Trump’s Cabinet, the decorated veteran was an ardent supporter of a War on Terrorism memorial as a member of Congress. The Global War on Terrorism, which is the official name used by the Department of Defense, is the longest in US history, but the number of casualties, to this point, is significantly fewer than most other US conflicts. The 7,000 who have perished over 16 years is about one-fifth the estimated 34,000 who died in combat during the Korean War and the 58,000 who died in the Vietnam War. News of Zinke’s announcement buoyed several military families, who said in interviews that a memorial dedicated to the post-9/11 wars is long overdue for congressional authorization. “We’ve been at this for 16 years now. And it’s been 10 years since my son was killed in the Global War on Terror,” said Candy Martin of Texas, a veteran herself and former president of the American Gold Star Mothers. Her son Thomas was killed by small-arms fire in Iraq in 2007. “The time to do this was five years ago,” she said. Some families, like the Manions and Martins, have made up for the lack of a memorial by setting up foundations in honor of those who have died and embarking on speaking tours. “The worst thing for a survivor is knowing that no one says the name of their loved one any longer — that no one knows about that individual or took the time to learn about that person,” said Amy Looney of Arlington, Va., whose husband, Brendan, was killed in a military helicopter crash in Afghanistan in 2010. Great Britain, one of America’s closest allies in the post-9/11 wars in Iraq and Afghanistan, dedicated and opened a national memorial to the effort earlier this year. Three years ago, Massachusetts broke ground on a state Fallen Heroes memorial dedicated to residents who died in the post-9/11 wars. Dan Magoon, cofounder and executive director of the nonprofit Massachusetts Fallen Heroes, lobbied lawmakers to secure funding and political support for that memorial. Magoon said he understood firsthand that the process could be hard, but he was still disappointed that it has taken Congress this long to make headway on a federal memorial. Andrew Brennan, director of the Global War on Terrorism Foundation, the named nonprofit in Moulton’s bill, has been working for years to pressure federal lawmakers to waive the 10-year waiting period contained in the law, called the Commemorative Works Act. The law was initially passed to slow the fast pace at which monuments were being built in Washington, D.C., since the Vietnam memorial was unveiled in 1982. A first of its kind, the Vietnam memorial was commissioned through a nonprofit and not the federal government, which opened the doors for dozens of nonprofits to begin lobbying lawmakers for other memorials, according to news articles at the time. The Commemorative Works Act created that process, and included the now-controversial 10-year waiting period for all war memorials. The law also established a 25-year waiting period before Congress can authorize a federal memorial of an individual, which begins at the time of the person’s death. In the years following, it became clear that the law had achieved its goal. The pace at which monuments were suggested, and created, significantly slowed. However, controversies over the war memorials have rumbled on. Some significant conflicts, such as the Civil War and the Revolutionary War, do not have national federal monuments, though several of the important individuals and battles have federal designations. Smaller wars, such as the War of 1812, the Spanish-American War, and the Gulf War, have little federal recognition at all. The biggest controversy surrounded the World War II Memorial, which opened in 2004 after years of design and fund-raising issues and took so long to create that many of the veterans who survived the war did not live to see the day. “Let’s not make that same mistake again,” said Manion, the Philadelphia woman who said the War on Terrorism was “forgotten” by the public. She runs a national nonprofit, the Travis Manion Foundation, named after her slain brother. With Zinke’s endorsement, along with pending legislation, Brennan is confident the memorial can be authorized before the end of this congressional term. The ultimate hope: a monument, prominently placed near the Vietnam and Korean war memorials, that will awaken public consciousness to the sacrifices by those who served in Iraq and Afghanistan — and those who continue to serve. Brennan said he also wants the eventual rendering to include an acknowledgment of nonmilitary officers who died, and to pay tribute to living veterans still struggling with trauma and post-traumatic stress disorder, and veterans who committed suicide.